Illustrator: The Fate of Yound Jewish Refugees from Nazi Germany. Some half a million Jews lived in Germany when Hitler came to power in 1933. Over the next decade, thousands would flee. Among these refugees, teens and young adults formed a remarkable generation. Born between 1914 and 1928 (approximately), they were old enough to appreciate the loss of their homeland and the experience of flight, but often young and flexible enough to survive and even flourish in new environments. Many would go on to make great contributions to their new countries and to the world. Walter Laqueur, himself a distinguished member of this group, offers a unique generational history of the young people whose lives were irrevocably shaped by the rise of the Nazis. They escaped to Palestine and the United States, to the Soviet Union and England, to South America and Shanghai and Australia. Some even remained in Germany, in hiding throughout the war. Some fled with their families and were greeted by friends and relatives in a new home. Others were completely alone, escaping from Germany or Austria through great danger and arriving in foreign lands with no help or support. They come from a variety of backgrounds -- some secular, some observant; some Zionists, some German patriots; some poor, some well-to-do -- but they are united by the experience of flight from Nazi persecution during their formative years. This generation produced such disparate figures as Henry Kissinger and "Dr. Ruth" Westheimer; noted academics and political leaders of both Israel and East Germany; even a Benedictine abbot, a Hindu guru, and a West African chieftain. 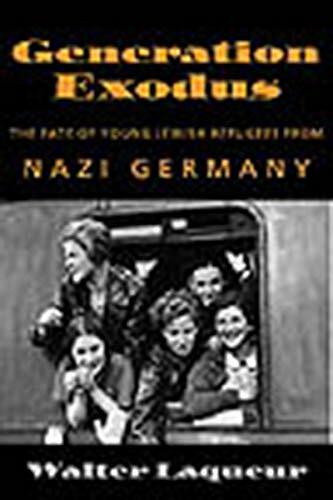 Drawing on interviews, published and unpublished memoirs, and his own experiences, Walter Laqueur skillfully braids together numerous individual stories and experiences to paint a vivid collective portrait of Generation Exodus.